Advantix for dogs prevents ticks, fleas, mosquitoes, sand flies, lice and biting flies. No large dog owner should be without the Advantix 4 Pack for Large Dogs between 10 and 25 kg (22-55 lbs.) Like other Advantix brand products, the large dog formula is completely water proof and continues to be effective after bathing or swimming. Not only will it repel and kill insect intruders, but it will even efficiently and effectively stop bites from all three of the aforementioned unwanted guests. Just make sure to keep this product away from cats or other pets, as exposure or ingestion is known to cause serious health issues. This product doesn't cover heartworm. There wasn't a product which covered all 3 until recently. At the moment only Nexgard Spectra covers ticks, fleas and heartworm which is only approved by European and Australian regulators. It is waiting approval from FDA. When is it due to expire the ones you are selling? All products are well within expiry dates. Generally the items are manufactured about six months ago with a three year lifetime, so on average you have about 2.5 years before the expiry date is reached. Advantix contains permethrin, an ingredient which repels and kills ticks, mosquitoes and sand flies for up to a month. Advantix is registered for the treatment and control of bush ticks, brown dog ticks and paralysis ticks. 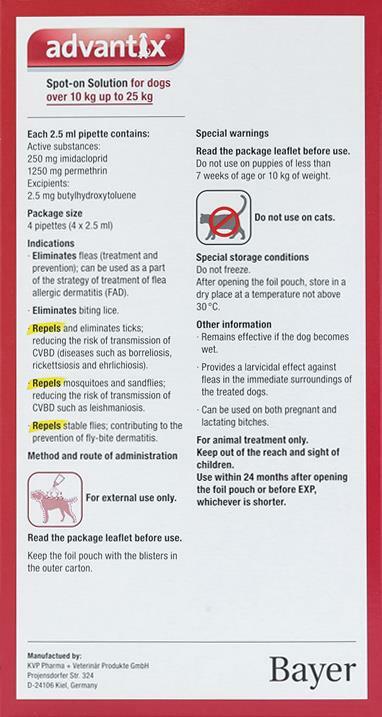 To control paralysis ticks Advantix should be applied every 2 weeks. Is this product the same as K9 Advamtix II? Does it contain both Permethrin and Imidicloprid? Advantage 11 is for killing the whole lifecycle of fleas and lice, whereas Advantix will also kill ticks as well as fleas. So they are not the same. It is a great product at a great price. Mailing time was very quick. Thanks!